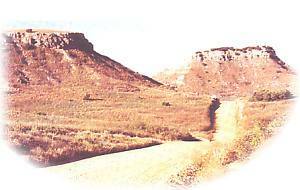 At high noon on April 19, 1892, one of the premier jewels in Western Oklahoma's crown was created.. Named for the Cheyenne Indians, whose reservation was opened for settlement on this date, Cheyenne quickly established itself as one the most exciting little towns in Western Oklahoma, and today serves as the county seat for Roger Mills County. Our claim to fame is the Washita Battlefield National Historic Site, located just two miles west of town. On Nov. 27, 1868, Lt. Col. George A. Custer and the 7th Cavalry attacked the Washita River camp of Cheyenne Chief Black Kettle. This was the beginning of the "Winter Campaign" of 1868-69, designed to bring an end to hostilities perpetrated by the Cheyenne and Arapaho Indians. The town of Cheyenne rests in the heart of the Red Hills country with many opportunities for sight-seeing, camping, hiking, and other recreational activities. If a laid-back atmosphere is what you are looking for, you have come to the right place. For an "Old West" adventure visit Coyote Hills Guest Ranch where you can saddle up and ride the hills. For a quiet and relaxing stay check out the Ivy Rose Cottage Bed and Breakfast, B & H Motel, or the Cheyenne Motel. For good Western Oklahoma food we have the #1 Okie Restaurant featuring barbecue in the evenings, Las Casuales for the Tex-Mex in all of us, the B & H Restaurant, and the Ivy Rose Cottage restaurant for that gourmet touch! Check out the local stores for some unique shopping experiences. There is something for everyone to see and do. Other attractions include the newly-renovated Black Kettle Museum, the Historic Museum complex in Cheyenne City Park, and the Pioneer Days celebration held each year on the first weekend after Labor Day. We also play host every five years to one of the biggest celebrations in Western Oklahoma, the Cheyenne and Arapaho Old Settler's Reunion, which will be held next in 2002. So y'all come and see us! Step across the threshold of this restored one-room school and see the teacher and scholars in 1910 dress. Relive McGuffy Readers, ciphering, inkwells and pens, lunchtins, outhouses, marbles, roll the hoop, ante over, lye soap, and more in this "hands on" history experience.